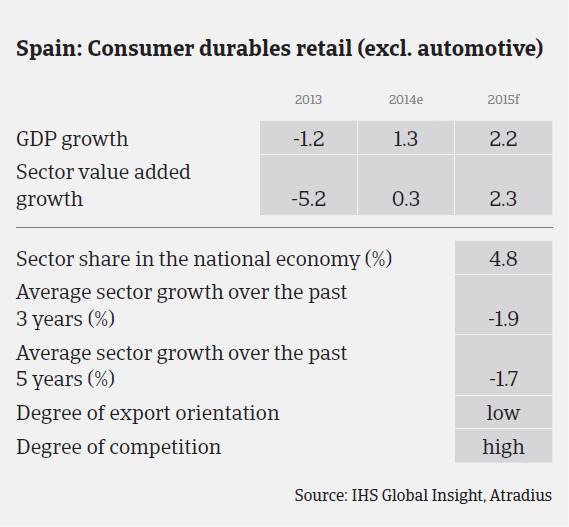 The forecast for Spain ́s economy seems to sustain further consumer durables sales in 2015. However, for some segments growth could be lower, given high purchase levels already seen in 2014. The rebound of the Spanish economy is gaining momentum, and this bodes well for the consumer durables retail sector, as this recovery is mainly driven by domestic demand. Spanish GDP is expected to increase 2.2% in 2015 after 1.3% in 2014, while private consumption is forecast to increase 2.8% in 2015 after growing 2.3% last year (in 2011 and 2012 private consumption contracted). Accelerating job growth and a better economic environment have lifted consumer confidence, as well as the fact that households´ expectations of their own financial situation has improved. Another important factor for the 2014 rebound was the more favourable pattern of consumer financing. Financial institutions have developed a greater willingness to grant loans to small businesses and to households for consumption. Vehicles: The extension of the PIVE (Efficient Vehicle Incentives Programme) led to higher sales in H1 of 2014, while demand softened in H2. In 2014, around 860,000 units were sold in Spain, a 19% year-on-year increase. It is forecast that close to 900,000 units will be sold domestically in 2015, assuming the PIVE is maintained and the economic rebound continues. Furniture: In 2014, the first increase in housing investment since 2007 boosted activity in the furniture sector, and turnover increased in each of the first three quarters of the year (by 5.3%). The rebound forecast for the housing market in 2015 should sustain furniture sales increases. White goods: In 2014 turnover increased 7.5%, with all segments recording growth. However, sales prices decreased. Brown goods: Sales of mobile devices increased in 2014. In the consumer electronics segment, sales increased mainly in H1 of 2014 due to the FIFA World Cup. 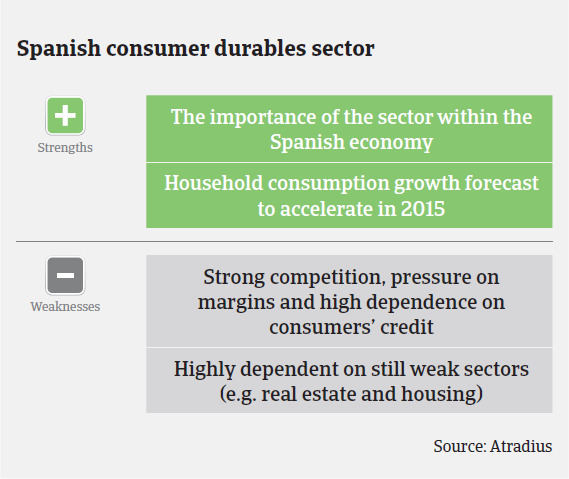 Looking forward, the forecast for Spain´s economy seems to sustain further consumer durables sales in 2015. However, for some segments growth could be lower, given high purchase levels already seen in 2014. At the same time, competition throughout all sectors is high, and profit margins remain low. The consumer durables retail sector has shown relatively good payment behaviour in 2014. We registered decreasing notifications of non-payments in 2014, and expect that payment delays will decrease further in the coming months. In any case, we monitor payment behaviour closely in all subsectors and inform our customers immediately of any deterioration. 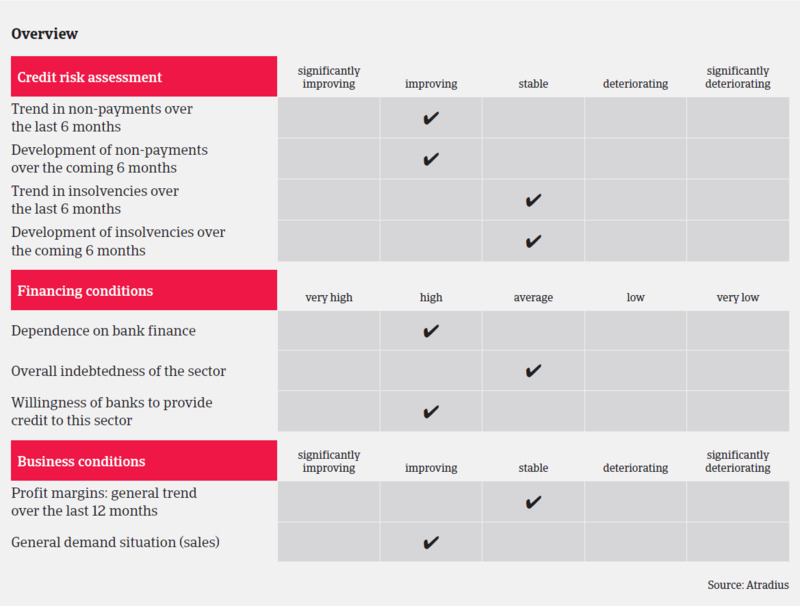 The insolvency environment is stable, with no major increases expected. While our underwriting approach is still cautious, due to the recovery of the consumer durables sector and businesses’ better access to external financing, we are more comfortable in increasing our exposure. However, in the white and brown goods segments, margins are generally low, and due to the higher sales in 2014, turnover growth could be more modest in 2015. Therefore, this subsector requires more attention and monitoring.